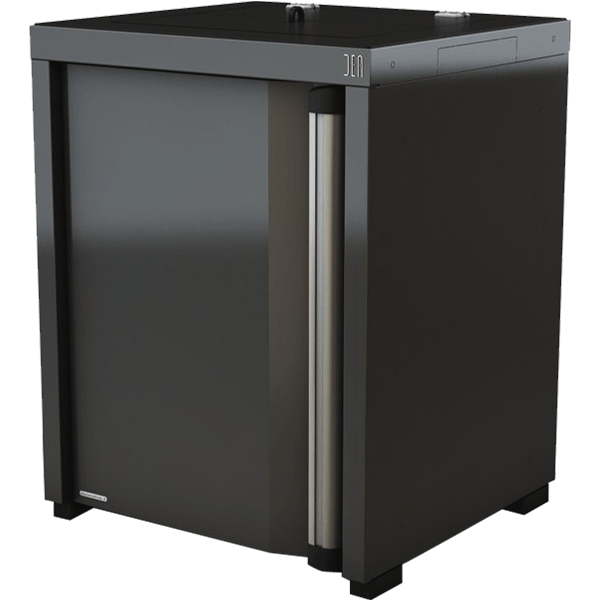 DEA Waste Containers offer over 10 different solutions for sorted waste collection. 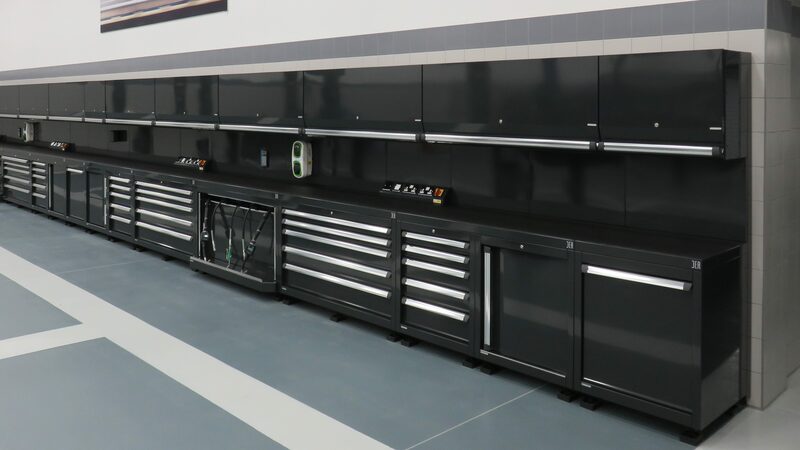 The selection includes fixed and mobile solutions, and cabinets with flat stainless steel bases for storing wheel-mounted containers. 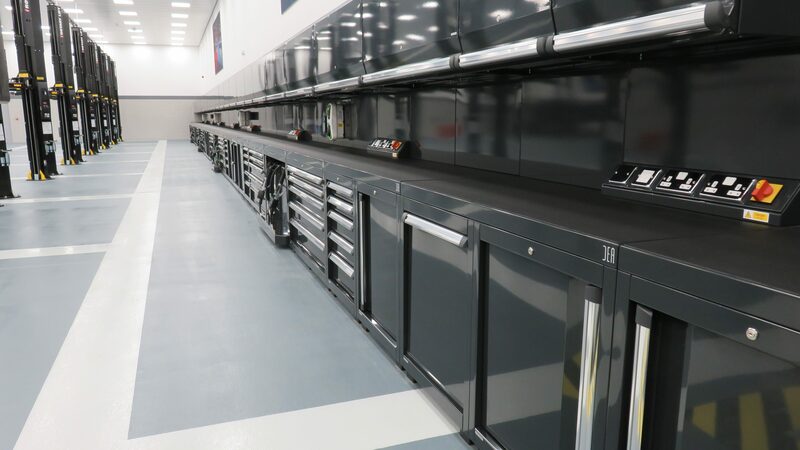 Ideal for every workstation, whether in the bodywork, mechanical, wheel alignment, or diagnostics areas. An ecological module with a large and high-capacity rail-mounted drawer complete with a double removable container for sorted waste collection. The removable containers are made from coated aluminium, and are equipped with handles for easy extraction and protective rubber feet. The ecological containers can be accessed from the front thanks to the stainless steel hatch. 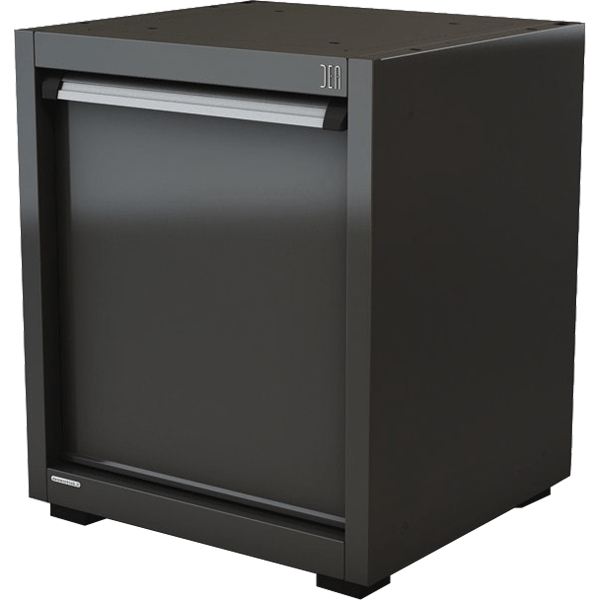 The cabinet is equipped with an ergonomic handle in extruded aluminium and adjustable feet for properly levelling the module. All the components are epoxy powder coated. 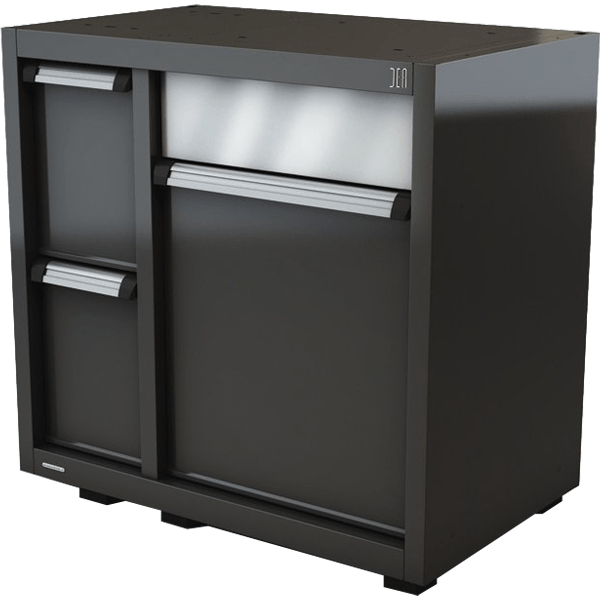 If combined with the fold-opening AR-152 worktop, the containers can be accessed from above with no need to extract the large drawer. It can also be combined with the worktops with openings (AR-130 + AR-VX) for the wash basin module. 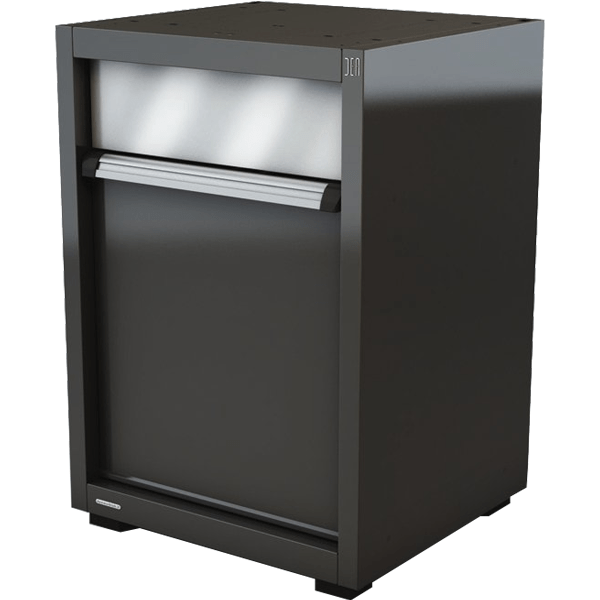 Drawers with a capacity of up to 30 Kg. Possibility to feed cables and hoses for connecting to local systems. An ecological module with a large and high-capacity rail-mounted drawer complete with a double removable container for sorted waste collection. The removable containers are made from coated aluminium, and are equipped with handles for easy extraction and protective rubber feet. The cabinet is equipped with an ergonomic handle in extruded aluminium and adjustable feet for properly levelling the module. All the components are epoxy powder coated. 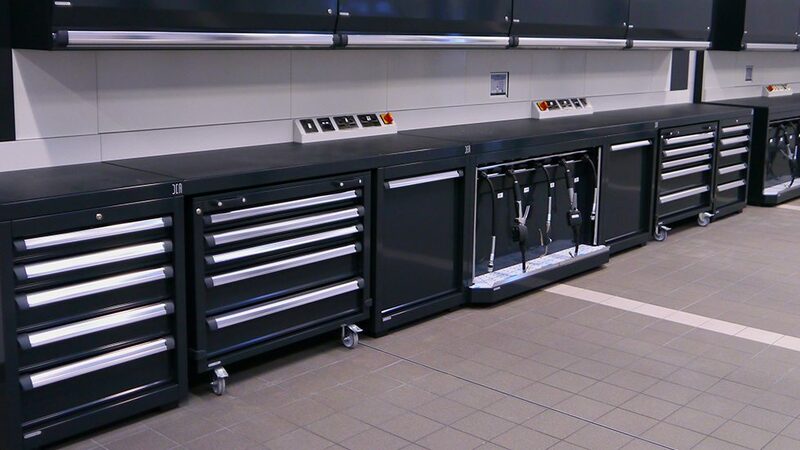 If combined with the fold-opening AR-152 worktop, the containers can be accessed from above with no need to extract the large drawer. Ecological module with extractable trolley, complete with four internal removable containers for sorted waste collection. The trolley comes complete with a retractable handle on the back to facilitate handling. The front handle, in extruded aluminium, on the other hand, allows it to be extracted from the fixed structure. The extractable containers are made from galvanised sheet metal, and are equipped with handles for easy extraction. The ecological containers can be accessed from the front thanks to the stainless steel hatch. All the components are epoxy powder coated. It can also be combined with the worktops with openings (AR-130 + AR-VX) for the wash basin module. 4 containers for sorted waste collection. Ecological module with upper “folding” door. The cabinet is equipped with a flat stainless steel bottom in order to allow for the easy insertion of a wheel-mounted waste container (not supplied). 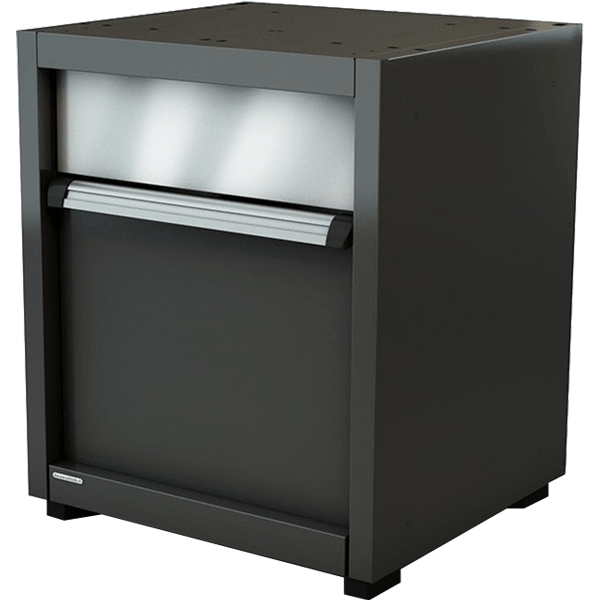 The cabinet is equipped with an ergonomic handle in extruded aluminium and adjustable feet for properly levelling the module. Possibility of access from above. 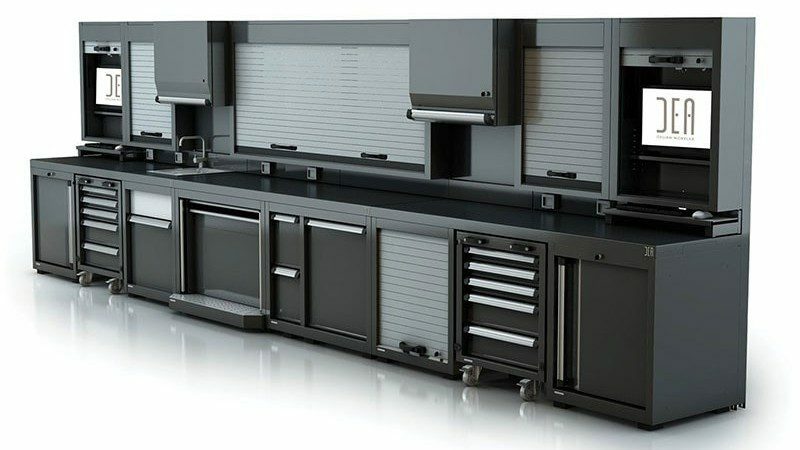 An ecological module with a large and high-capacity rail-mounted drawer complete with a double removable container for sorted waste collection, and two drawers with extractable containers ideal for small components. The removable containers are made from coated aluminium, and are equipped with handles for easy extraction and protective rubber feet. The cabinet is equipped with an ergonomic handle in extruded aluminium and adjustable feet for properly levelling the module. 4 separate containers for sorted waste collection. 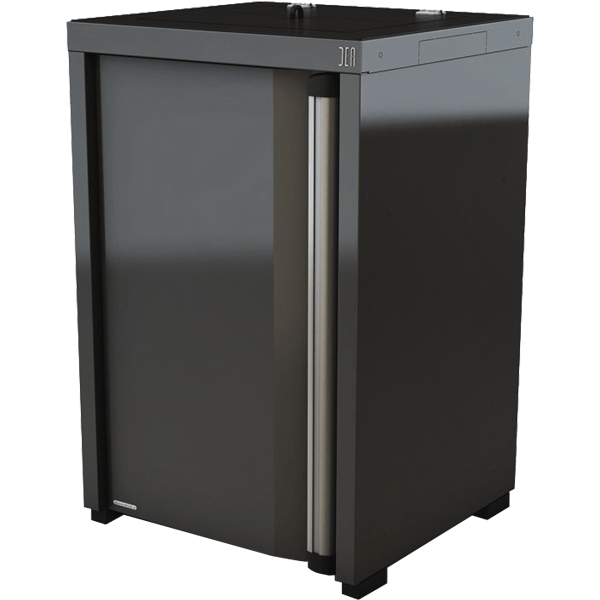 An ecological module with a large and high-capacity rail-mounted drawer complete with a double removable container for sorted waste collection, and two drawers with extractable containers ideal for small components. The removable containers are made from coated aluminium, and are equipped with handles for easy extraction and protective rubber feet. The 2 ecological containers can be accessed from the front thanks to the stainless steel hatch. 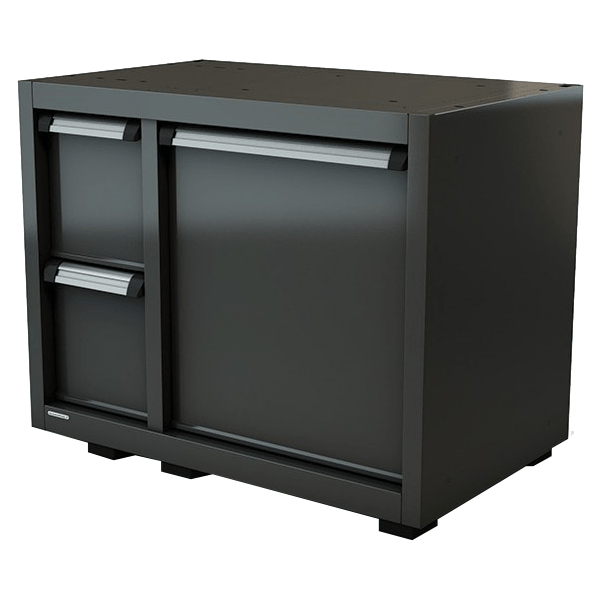 The cabinet is equipped with ergonomic handles in extruded aluminium and adjustable feet for properly levelling the module.